Thyroid medication is often presented as the “magic hammer”, making everything a nail. The longer I have been in practice, the more suspicious I have become of the idea that one medical remedy fixes everything. I especially felt this way about the thyroid, as people are often coming into the office thinking that they have low thyroid with very “normal” labs. Now, many years later, and after much research, I think those previous people were probably right. 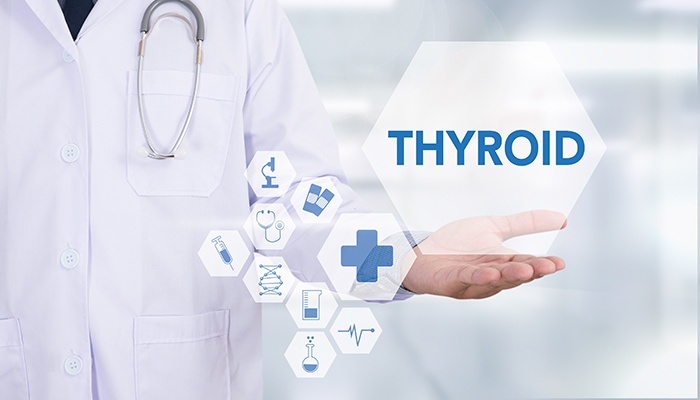 Thyroid is a really important piece of the puzzle that is not being treated correctly, especially by the people who are supposed to understand it, doctors and the endocrine specialists. I would like to shine some light on this essential gland and the important role it plays and why we are misguided when it comes to monitoring its function through our current methods. The thyroid gland rests at the base of our necks and is not really noticeable unless it is palpated or a person has a goiter (low iodine and thyroid antibodies are two reasons for a goiter). The thyroid gland takes iodine from the bloodstream, of which we need about 1 mg a week, and concentrates it. This iodine, along with Tyrosine (an amino acid), makes Thyroxine /T4 (which is 4 iodines and 2 tyrosines) or it makes triiodothyronine/T3 (3 iodines and 2 tyrosines). 93% of what is released by the thyroid gland is T4, and 7% is T3. Most T4 has to be converted to T3 which is 4x more bioactive and this is what the cell needs to function correctly. 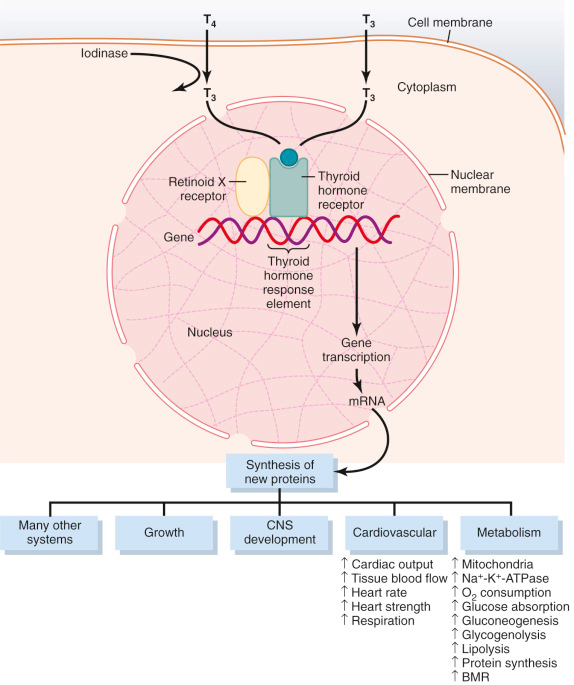 Once released from the thyroid the thyroid hormone (Free T3 or Free T4) is in the bloodstream, however, it has to be moved into the cell to accomplish its many tasks (see Fig 1) and this requires energy (in the form of ATP made by cell mitochondria) or active transport. Now what’s interesting is that the gland that tells our body whether we need more thyroid, does not require energy to move thyroid into its monitoring cells. This creates quite the conundrum as we shall see. 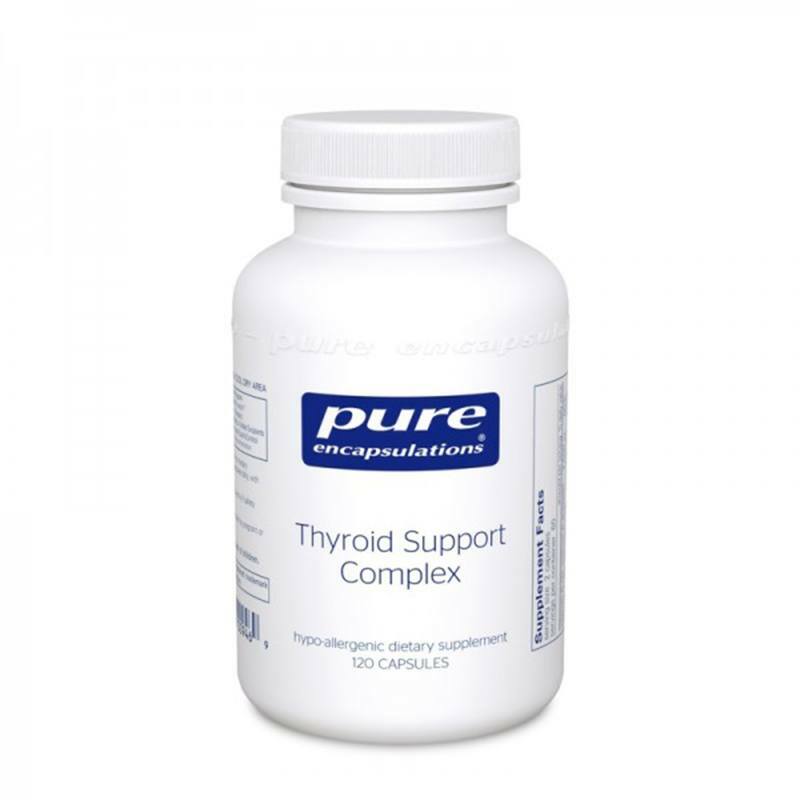 The thyroid hormone is released from the thyroid gland by signaling from the pituitary in the brain, which is accomplished by Thyroid Stimulating Hormone orTSH. This TSH will increase or decrease production of thyroid hormone depending on the amount of thyroid hormone in the blood. The transport of the T3 and T4 into the pituitary is not dependent on energy, or in other words it uses passive transport. 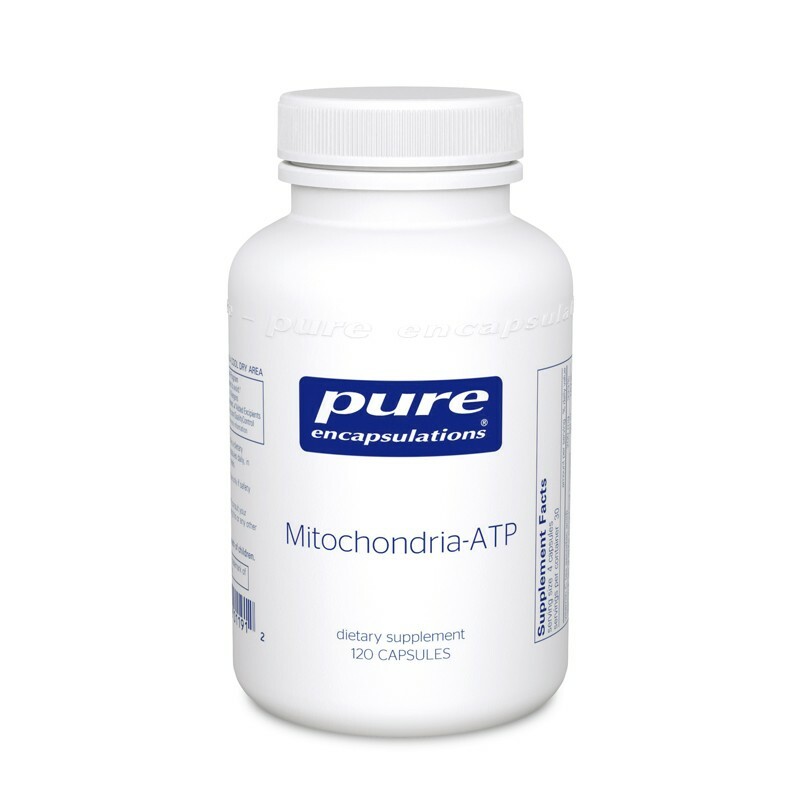 So if we have a condition like Chronic Fatigue, Bipolar, Chronic Depression etc., that has known mitochondrial depletion/low cellular energy status, our brain will be getting a different message than what our cells are getting. The brain will think everything is going OK, because it has plenty of thyroid, while are cells are completely deficient. The processes shown in figure 1 cannot be completed, which ironically, includes improving mitochondrial function, and so, we feel like crap. So we basically get into a paradox. The cells need thyroid, but because of the cell’s low energy it cannot move into the cell. Now, the brain is getting the false message that everything is fine, because it does not require energy to get thyroid to the pituitary and hypothalamus. The cells themselves are thirsty for thyroid but the brain thinks since they are sitting in the ocean and they should be fine. As the saying goes, “water, water everywhere and not a drop to drink”. What is to be done? Unfortunately, there is no testing that allows us to see into the cell for thyroid levels, so once again, a conundrum. Basically, we treat by trial and error. This is an area that definitely needs more exploration, but in a recent study they found that patients with Bipolar and Major Depression responded to 4x the dose of T3 and T4 that the body requires. They did not develop symptoms of high thyroid and felt much better. Normal patients, when titrating up on thyroid meds, developed palpitations, anxiety and other symptoms of high thyroid when doing this dosing. Patients on high dose thyroid, and who needed it, did not develop these symptoms short term or osteoporosis and other long term side effects. This would make sense, because on a cellular level, they needed high doses to just to get to “normal” inside of the cell. There are times to step out of the box when it comes to patient care. I think this is one of those cases, as the data and physiology definitely support, a trial of thyroid meds when everything looks fine in the blood tests. These are the things that need to be kept in mind when it comes to diagnosing and prescribing for patients with low energy levels and signs of mitochondrial dysfunction.